im using an RCA lead in fact give me a min and i will take some pics for you.... now that i think of it i didn't know where to connect the input negative lead on Nicolas' design so i left it alone, i'm guessing i need to connect that to the neg on bleepy machine. but that leaves me with my other issue of random beeps out of the sequencer i will get a recording now for you both with pics and with the bleeper and without give me 2 mins. OK so i have included a vid of the sequencer stepping and some pics, and some sounds. let me explain. So i use an RCA cable to go from the sequencer into the bleepy machine, then i use rca from the bleepy machine into the mixer. in the case of the picture bellow i plugged the RCA directly into the mixer to test with. this first sound is just the sequncer hooked up to the mixer. this is the static sound when nothing is turned on, and goes away when power is unplugged form the sequencer. Any help would be grand, i seem to be at my wits end to the issue, or perhaps i am too close to see the issue and some outside eyes might help, sadly non of my friends are any good with electronics let alone be able to tell the difference between a cap and LED. I'm going to be posting on Nics' board as well to confirm that i have my wiring on that side done correctly. I have tried both, minus feeding the sequencer into a mixer directly to see if its giving output for each step and I have also tried to feed this into a VCO/LFO the one that Nicolas designed. in both cases I get allot of static, and a random beep at any given step. The sequencer itself does not generate sound. Plugging it into the mixer should do nothing, or very little. 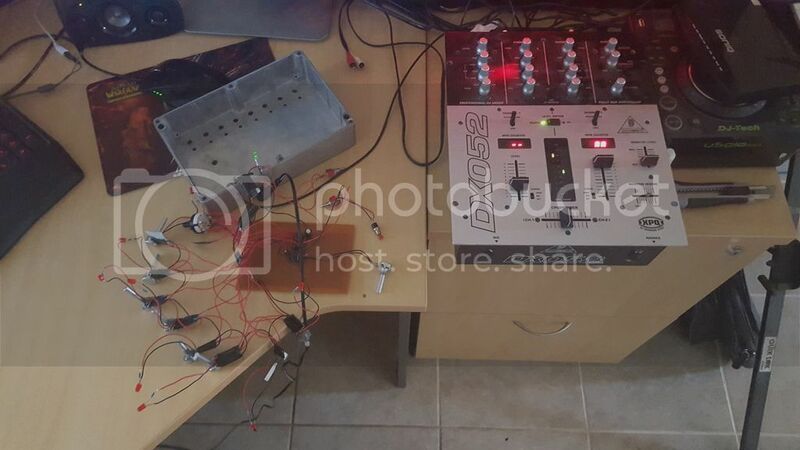 The sequencer sends control voltages that should go to the CV in (v/oct, or linear or exponential FM) of a VCO for testing, and then that VCO's output to the mixer; or else you can hook it up to a meter and run the sequencer at a slow rate and measure the voltage output. Edit: I'm not familiar with the bleepy machine, but the same commentary about using control voltage inputs applies. Which output of the sequencer are you hooking up? Just to verify the CV out, not the gate out, correct? understand that there is no output sound when no sound is genarated this is why im confused with my resaults. the reazon i plugged in the sequencer direct to the mixer was to isolate the static and the phantom beeps. both coming from the sequencer. and i know it shouldent. will a picture of he strip board front and back help? I've built the sequencer as per the first post with all the minus mods. The lights go on in the correct sequence but are suuuuupppppeeerrr slow and the rotary switch doesn't have any effect. The reset button works but the step button does not. The main 1m pot doesn't appear to do anything, whereas some of the step pots dim and brighten the LEDs, some not. I have went over my soldering and fixed an error or two and replaced the IC s but obviously something is still wrong. if you can't change the clock speed, I'd start with the area around the 555 timer. It works by charging and discharging the 1uF cap, and using a comparator to decide whether it should be charging or discharging. If you disconnect the link from pin 3 of the 555 to "e", what do you see on pin 3? This will decouple the 555 circuit from the 4017 so you can focus on which part is at fault. As for the step switch, did you omit the dark green link? You don't mention if the start/stop switch works? My bet is you have the link there and so the switches don't do anything. Ok so I disconnected the 555 and it appears to function correctly, cycling through each step when the button is pressed if a little flaky at times. When I connect a crocodile clip to one of the legs of the momentary stepper button and hold the other in my hand it goes super fast through all the steps . The rotary switch appears to do as it is supposed to. When i reconnect the pin 3 to e connection I can replicate the quick sequence bend but the momentary stepper no longer works. ive replaced the 555 twice in case so unless it's a bad batch I'm not sure what could be wrong. The speed knob still doent work and it's stuck on one step without bending. My reset button works fine and also if relevant when I switch the power off then off again the step moves one step on. If you disconnected the 555, I'm interested in whether the 555 is behaving correctly. Edit: by correctly I mean that the 555 should be cycling continuously, at a rate determined by the pot. It shouldn't just cycle when the button is pressed -- if that's the case the button is not where you think it is. Further, pressing the button to step the 4017 *might* work occasionally because you could be generating some noise at the clock input of the 4017 by doing so, but if there's no 555 hooked up to go through the button, that's pure chance. i have rebuilt and the board was fine after all, was still getting the same results. what i realised is that i must have a bunch of faulty pots. replaced the main speed pot and i have the correct function. however only a couple of the other pots affect the steps . so im assuming faulty pots here as well unless theres anything else that would stop the pots from affecting the steps? only 3 of the 8 do anything currently. I would pause the clock, manually step to one of the ones giving trouble, and measure the voltage at the wiper as you change the pot. If that's not changing, or there's no voltage at all, then definitely a bad pot. I have experimented a little with the 4017 as a sequencer. I had tried building a stomp box drum machine but the leading and trailing edge of the signal pulse both cause a triggering affect. Using a leading edge detector on each output made the circuit to large to fit in the Hammond bb size box. Is there any available similar IC that will act as a decade counter with a controllable pulse width. I'm not in to micro programming at all. It's way beyond me. i built minus' vero layout at the top of this thread last summer and tried to implement/integrate what i think are all the necessary basic mods and tweaks (from the ensuing discussion) required in order to get it to work as intended (cap from pin 5 of the 555 to GROUND) but still no joy. revisited it this afternoon but still can't get it to work. thanks anyway to elmegil for his troubleshooting mission with this one. while i could never say i haven't made some idiotic mistake, i have been pretty careful and followed standard vero debugging practice. cutting between tracks, checking grounds, cap orientation, etc. have completed much bigger vero layouts than this without issues. so has anyone built this according to minus' vero and got it to work, and what did you have to tweak to get it from that layout to functional. or does anyone have a verified vero layout for the baby 8? I'm sorry you are having issues with this. It's a fairly simple circuit and looking again at the diagrams I can see no reason why it wouldn't work. 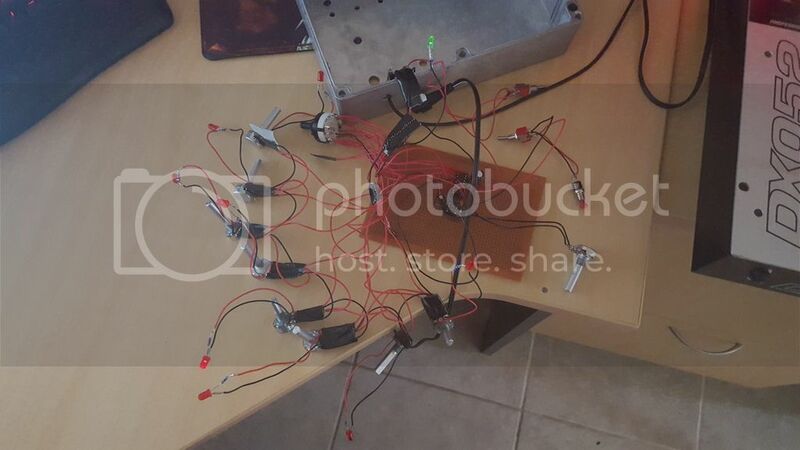 Have you soldered all the pots on and LEDs? What are the LEDs doing? I suggest we start at the clock output, PIN 3 of the 555. Can you hook up a wire from there to a resistor to a LED to GROUND? Is there any oscillation going on? If the clock is confirmed working then the connection between the clock and the 4017 is the next thing to check. In the meantime, are you sure the components are all soldered in the correct place. If something is wrong, I'd imagine it could be in the connection of the other hardware, the pots, LEDs etc going to the board. The style of artwork doesn't help much either! Off board wiring on a separate strip board is essential; its the only way to build a step sequencer sans designing a PCB. Thanks for this awesome and useful design. i´ve added external clock input i have soldered wire d to the middle leg of the spdt and external clock ( doepfer clock) and onboard 555 clock to the ears. on battery it works fine, but when i connect it to the 12v of my busboard the sequencer didn´t run on external clock input. hope that someone could help me. I have tested this on breadboard and it seems to be working OK. Let me know if you find any mistakes and I'll correct the layout. Feel free to add to the circuit and modify it to your own needs.